Amped Software will be participating at the S-FIVE International Workshop on June 15-18, in Brussels, Belgium. The workshop is aimed at bringing together various parties that are active in the field of Forensic Image and Video Enhancement: forensic scientists, investigators, academic researchers, companies, etc. to discuss the results obtained from in-depth surveys about experts’ practices and the Collaborative Exercise which was dedicated to testing different tools and methodologies on some common set data. 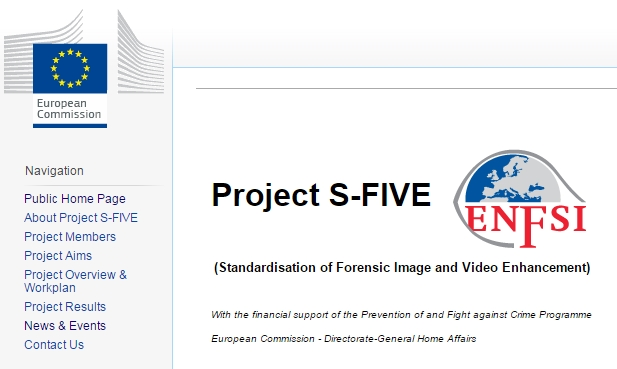 The S-FIVE project is a project funded by the Prevention of and Fight against Crime Programme; European Commission – Directorate-General Home Affairs, through the European Network of Forensic Science Institutes (ENFSI) Monopoly 2011 programme “Improving Forensic Methodologies across Europe” (IFMAE). It is an interesting project which aims to define guidelines for image and video enhancement in the forensic community and will study various issues related to the Standardisation of Forensic Image and Video Enhancement (S-FIVE). The main focus of the project is oriented towards techniques that are used for improving the quality of surveillance video data and other types of images that portray persons and objects at the macroscopic level. Amped Software will present our findings as well as be on-site for product demonstrations. This entry was posted in Announcements, Events on June 11, 2015 by Darlene Alvar.